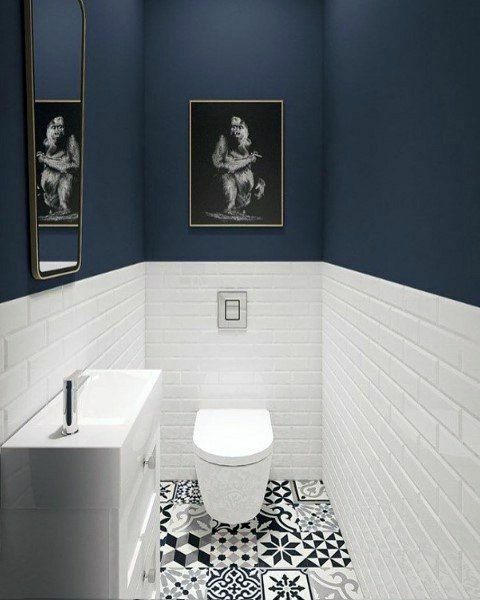 When it comes to colorizing your bathroom, navy should be on the top of the list. It’s definitely one of the most stylish shades which will never fail to style up your bathroom decor. Navy simply gives an elegant look which fits really well to create a modern decor. 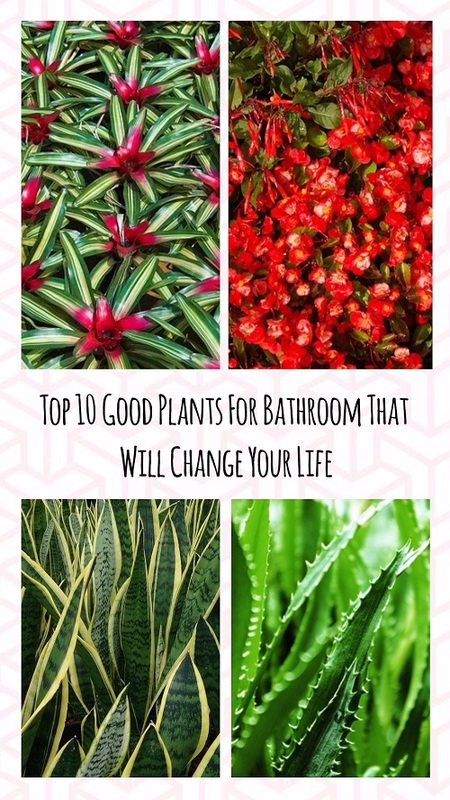 It sparks a very inviting vibe which makes your bathroom feel so inviting at the same time. 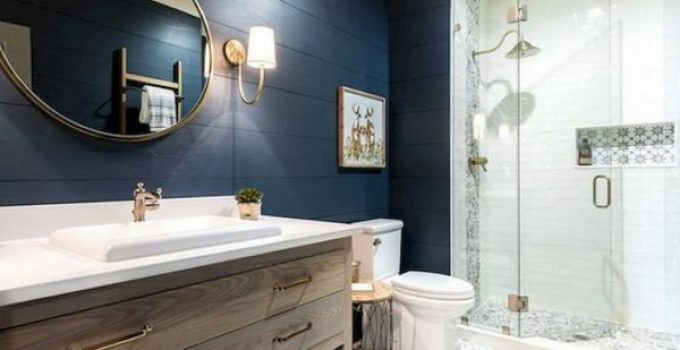 For sure, choosing navy as the main or additional color for your bathroom is totally a good idea. 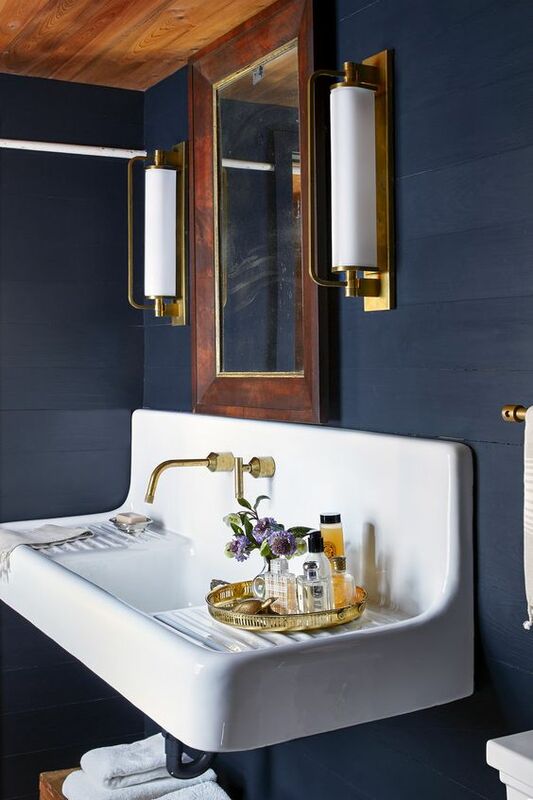 Check out some mesmerizing inspiration of navy bathroom ideas that you can use as the reference below! Here, the beadboard accent of the wall is colorized by navy, creating a chic farmhouse nuance. White ceiling and fixture then brighten up the room in a very beautiful way. Basically, this one is an all-white bathroom decor then navy takes over half of the wall’s space. Some accessories also come with a little bit touch of navy to create a mor attractive overall look. 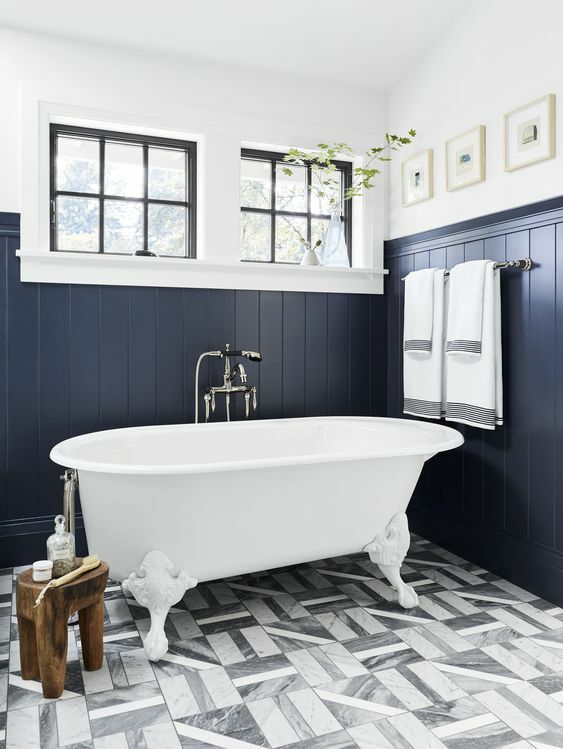 It’s a full navy bathroom which feels so inviting with its wood flooring in the chevron pattern. 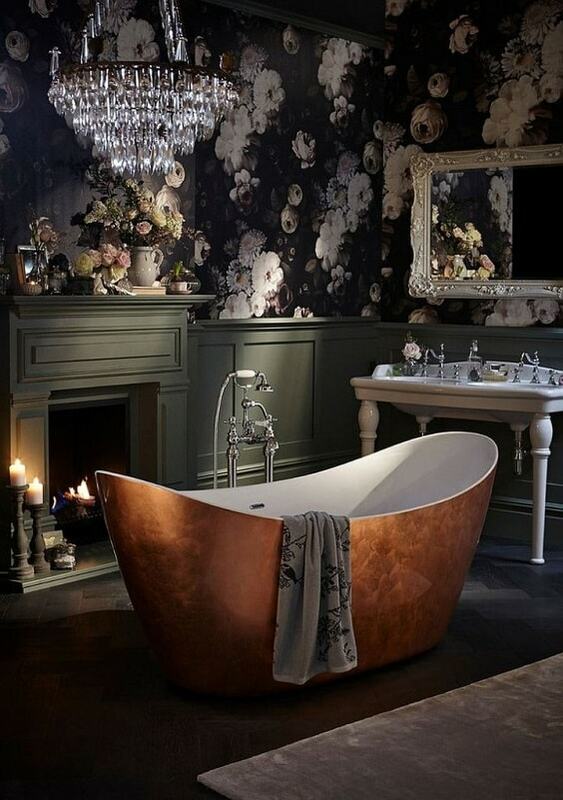 Almost all of the bathroom fixtures come with pedestal legs which give a gorgeous vintage touch to the room’s decor. All sides of the wall is colorized in navy and the white handles the rest of the room in this stylish inspiration. It’s a nice navy bathroom for you want your kids to have their own bathroom. 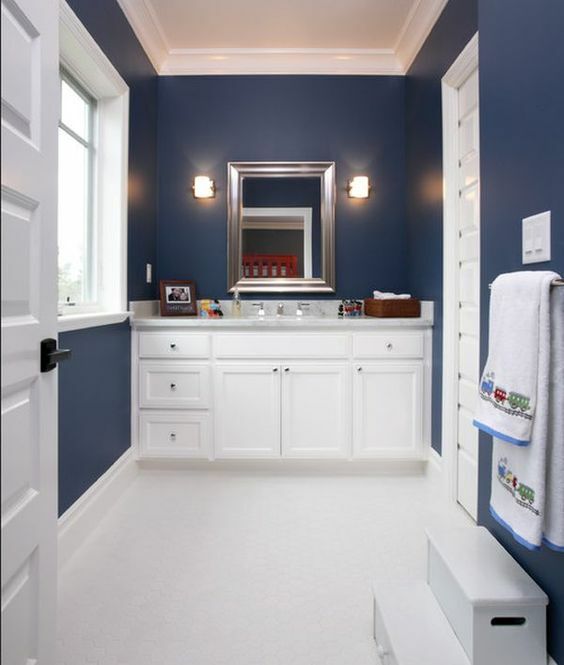 A fabulous navy bathroom with a very nice texture of its wall which creates a more distinctive overall look. An oval mirror with rope frame tells us that the room is decorated in nautical style. 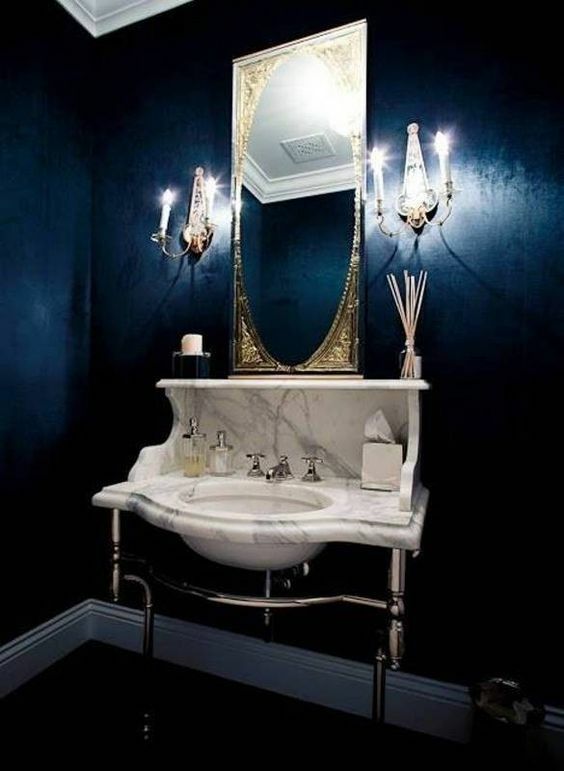 In this idea, navy vanity in country style becomes the main focal point. It gives a bold touch in a bathroom which is dominated by white. 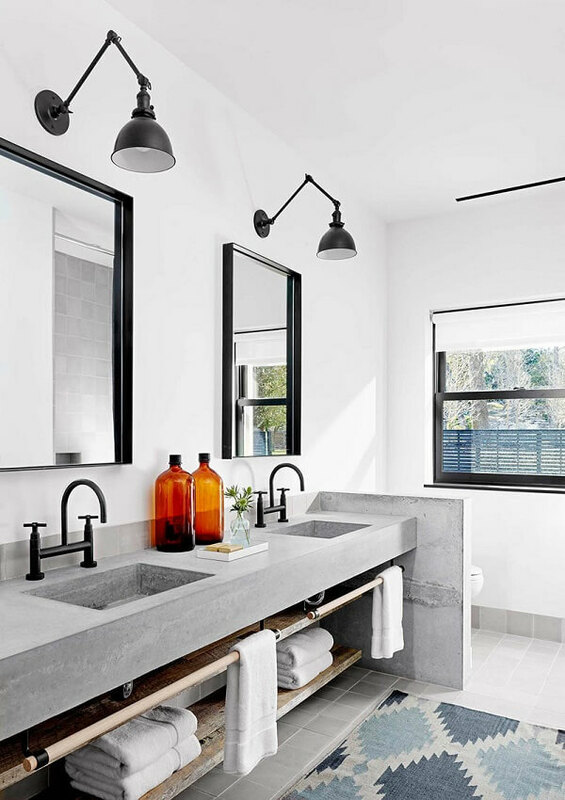 All of the accessories like mirrors and faucet complement the vanity stylishly. 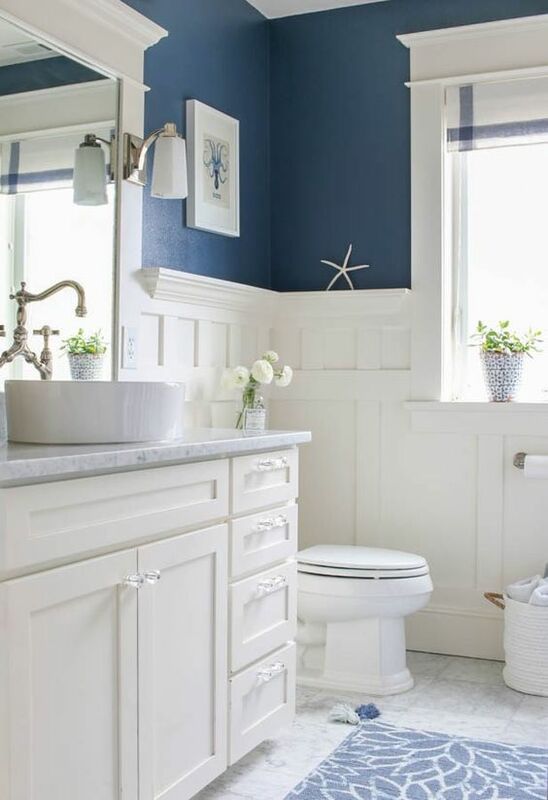 With some accents on its wall, this white and navy bathroom looks so admirable. The vanity beautifully matches the overall decor of the room and makes it look even brighter. 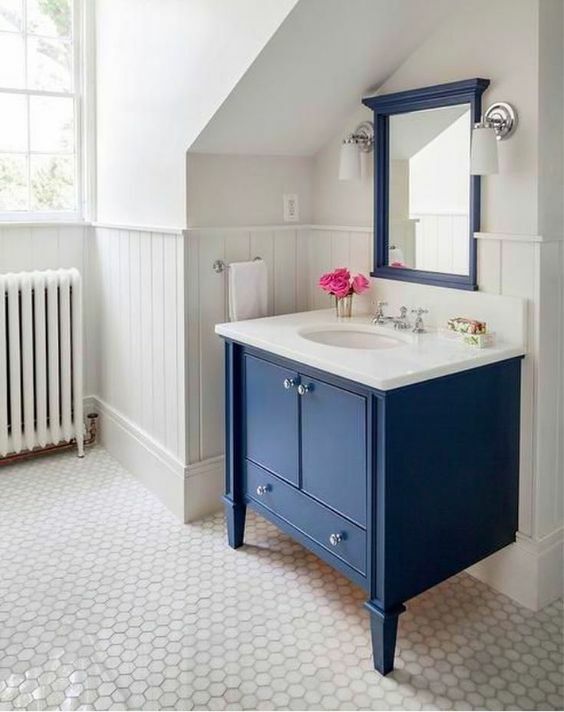 If you are looking for a navy bathroom with a cuter decor, this idea is a good reference for you. The navy wallpaper in stripe pattern covers all sides of the wall while the hot tub in similar color matches gorgeously. 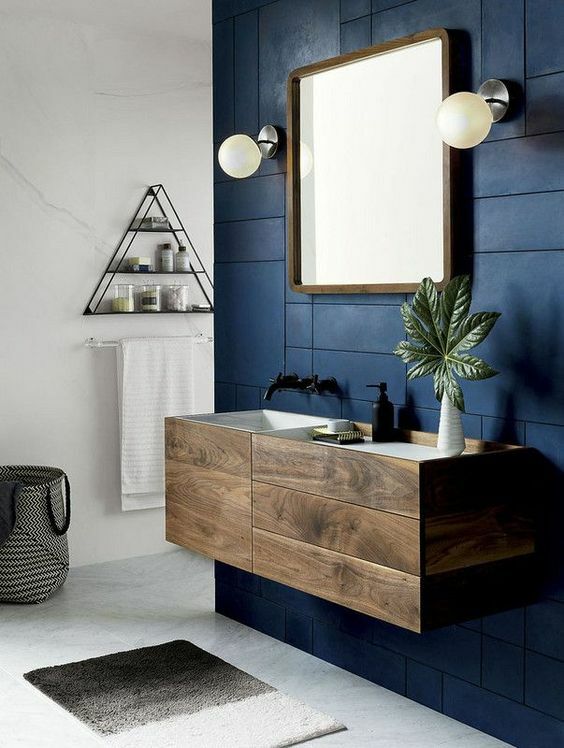 The wall with wood plank texture in navy looks so fabulous in a bathroom withthe white overall look. 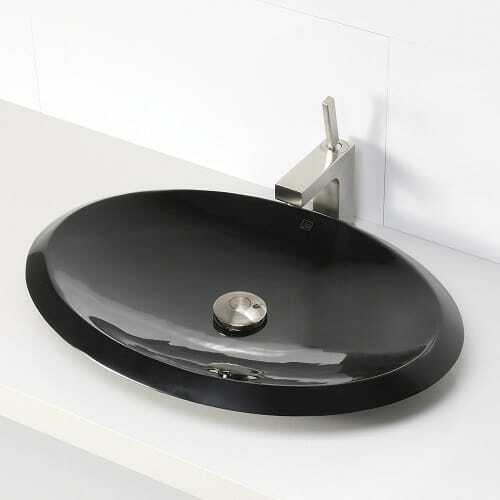 As the focal point, the vanity in the natural wood finish adds another color attractively. A big vanity and wardrobe in bright navy is made as the focal point which colorizes this bathroom with white wood plank wall stunningly. The color combination creates a very catchy nuance with an inviting vibe. 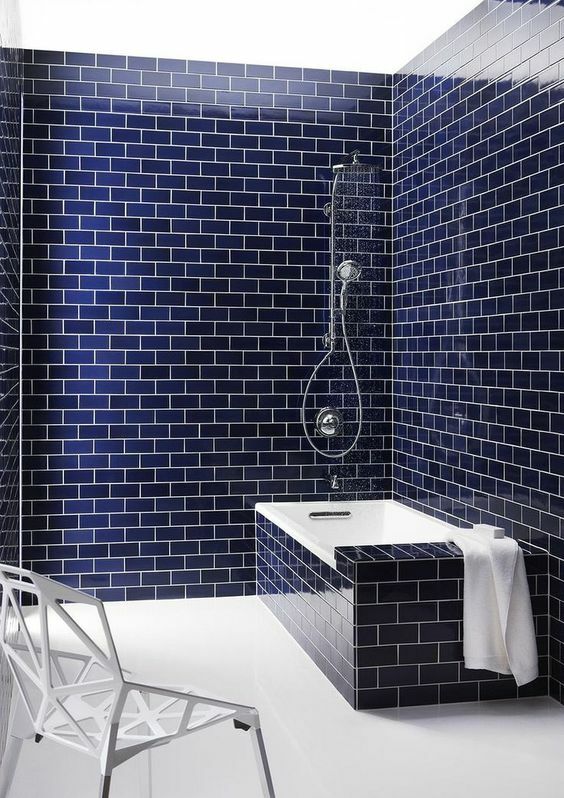 The glossy navy subway tile covers all sides of the wall and the bathtub which creates very awesome decor. White then balance the nuance so it doesn’t feel too intimidating. 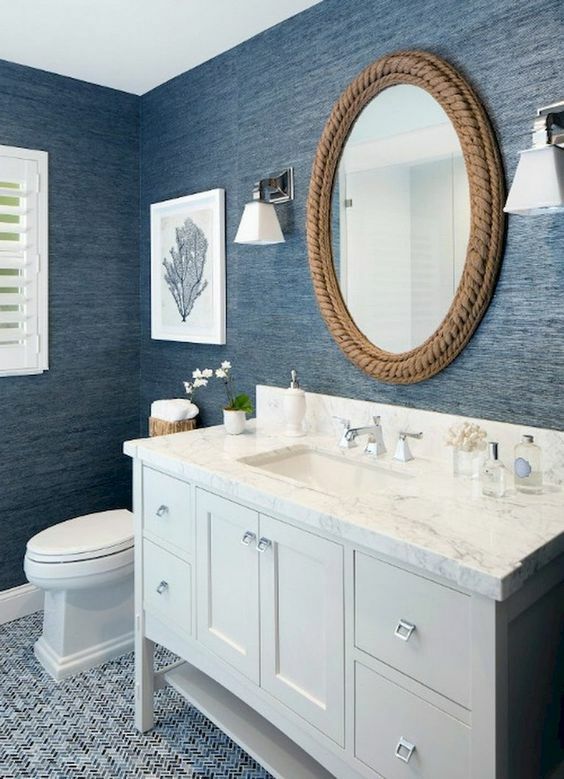 Here, navy only colorizes an accent wall which works as the vanity area in a chic contemporary design. 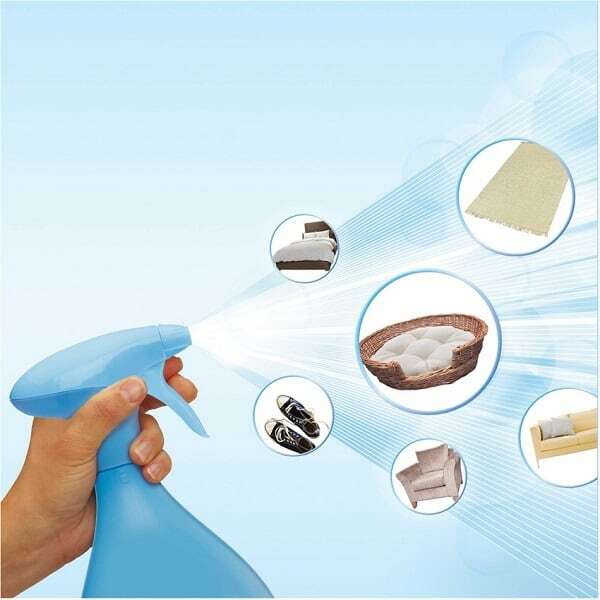 It brings the style of the room’s decor to a whole new level. 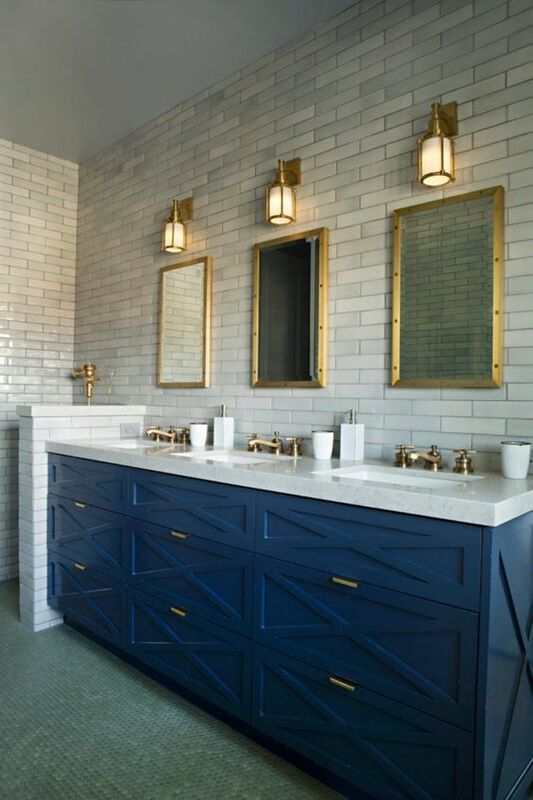 In this bathroom, 3D subway tile covers one side of the wall which creates a unique texture to its overall look. Then, the rest of the walls are colorized by navy which adds a more colorful touch. A very mesmerizing with white and navy combination for you who love the glamorous decor. Long big vanity with 3 mirrors with its vintage is the main focal point which really grabs everyone’s attention. 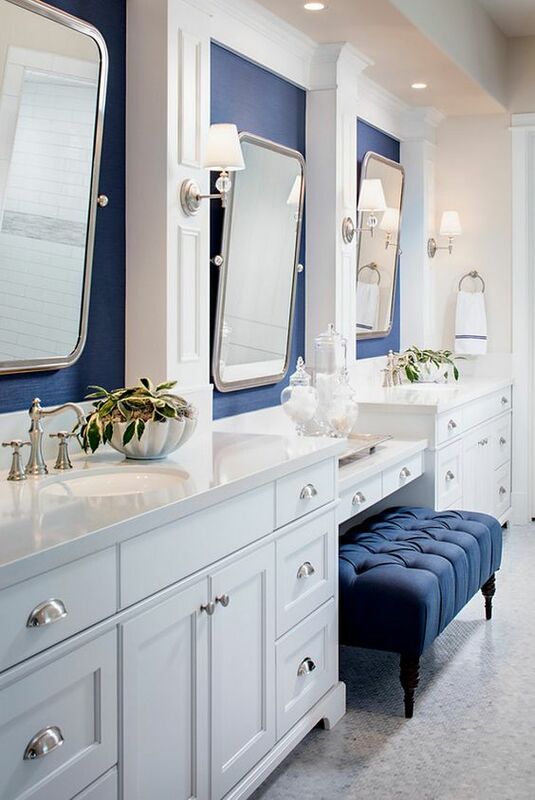 A navy small wall-mount vanity and mirror in navy simply give a nice color to this bathroom in the all-white overall look. The room looks distinctively attractive with its chic combination of pattern and texture. 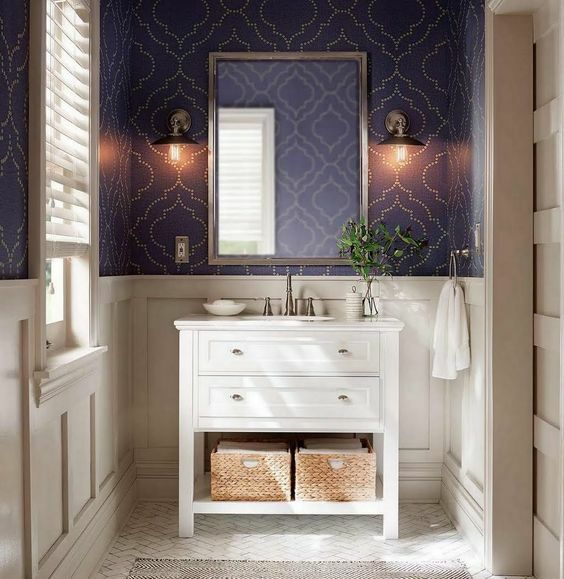 The navy wallpaper with a Moroccan pattern makes this simple bathroom in white looks way more attractive. It gives another style which is inspiring to copy. 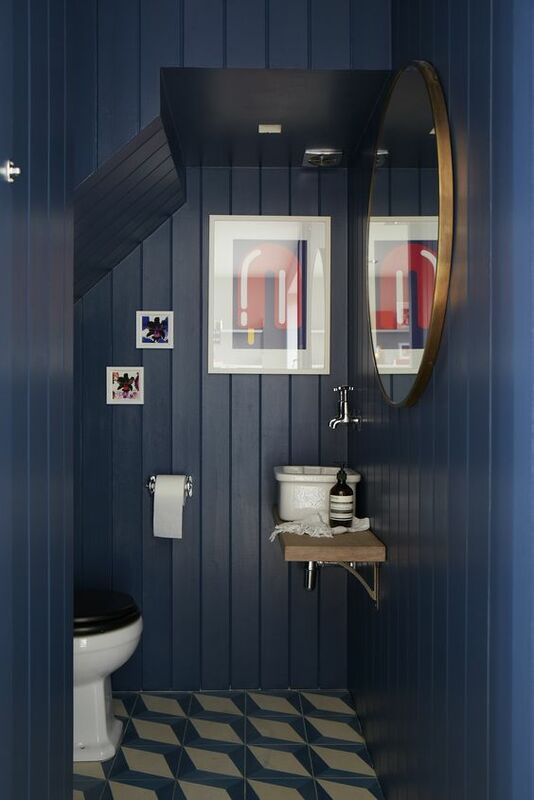 Wood plank in navy is made as the walls of this gorgeous bathroom. The ceiling is finished in natural wood which give a vibrant color touch in a natural way. 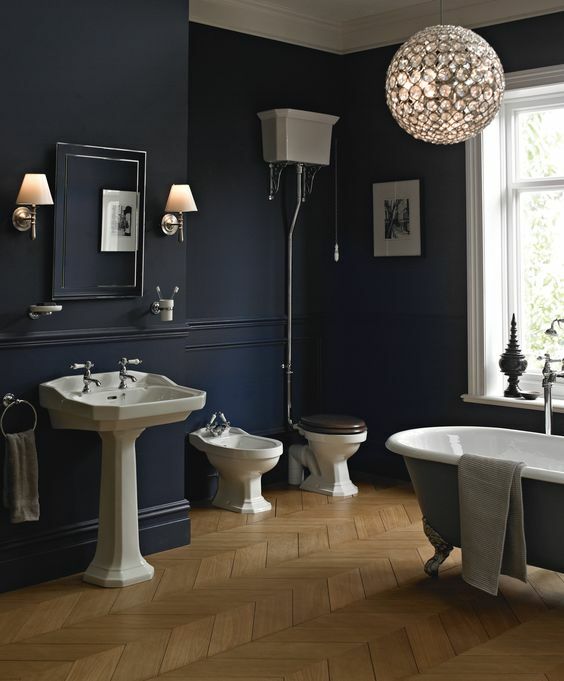 This bathroom looks elegantly admirable with its deep navy main color. To brighten it up, the flooring and some accessories are finished in natural bright wood. 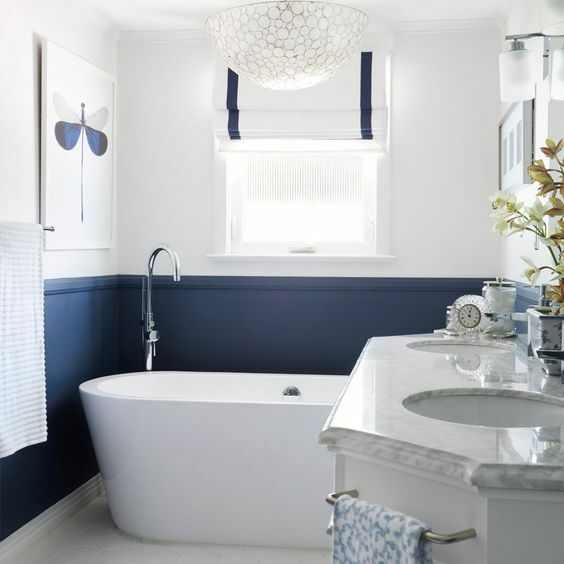 A gorgeous white and navy bathroom with a minimalist decorating style for you who love modern decor. The white tile gives a stylish texture which makes the decor look much catchier. 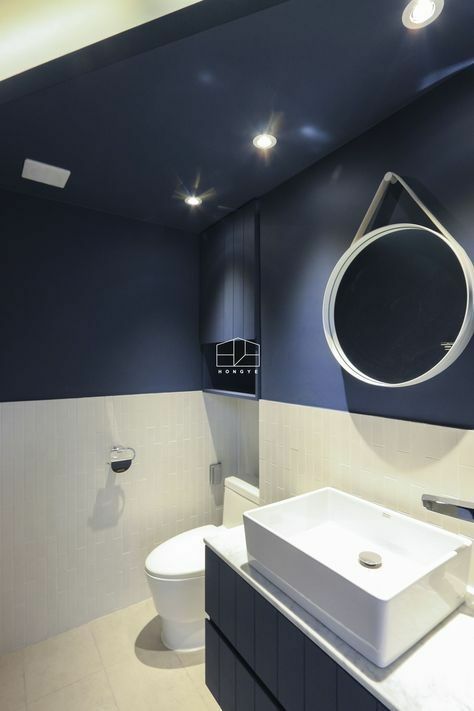 All sides of the wall and ceiling in this navy bathroom is made in beadborad texture which makes it look distinctively decorative. Moreover, its unique tie with 3D pattern gives a more sophisticated touch. 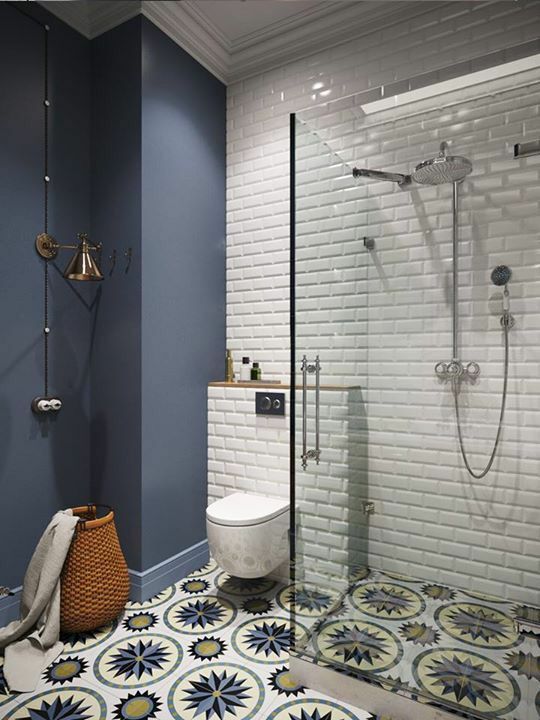 A long narrow bathroom which combines white subway tile and navy for it falls. Such combination gives a brightly elegant with a very inviting atmosphere. 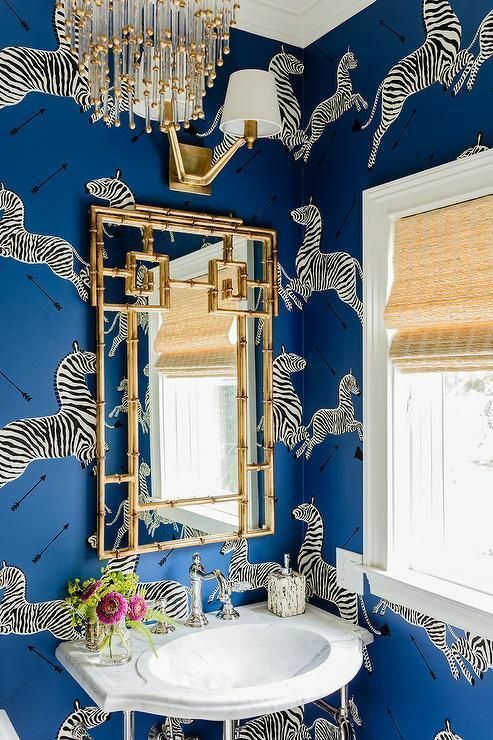 Obviously, the safari navy wallpaper with zebra pattern is the main factor which makes the bathroom look so distinctive. 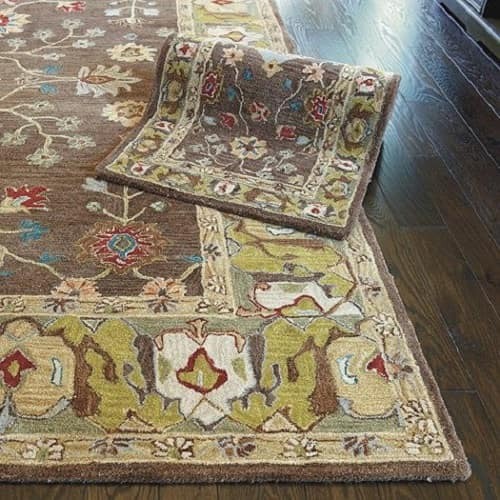 The earthy accessories complement the room’s overall look very well. Navy colorizes almost all the space of the room (except the flooring) which creates a very stylish elegant overall look. Then, the gold finish from the room’s accessories glamorize the decor. The textured navy of this bathroom wall’s gives such a gloomy nuance. Then, some vintage accessories decorate the room which gives a gothic touch uniquely. 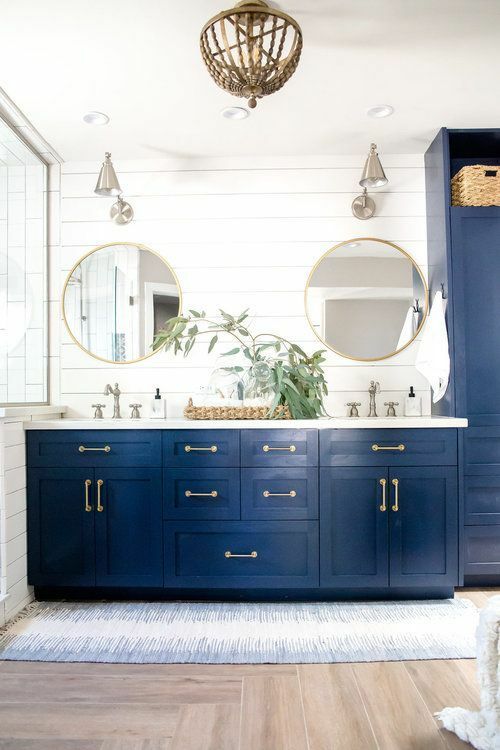 So those are some awesome navy bathroom ideas which are so tempting to copy. 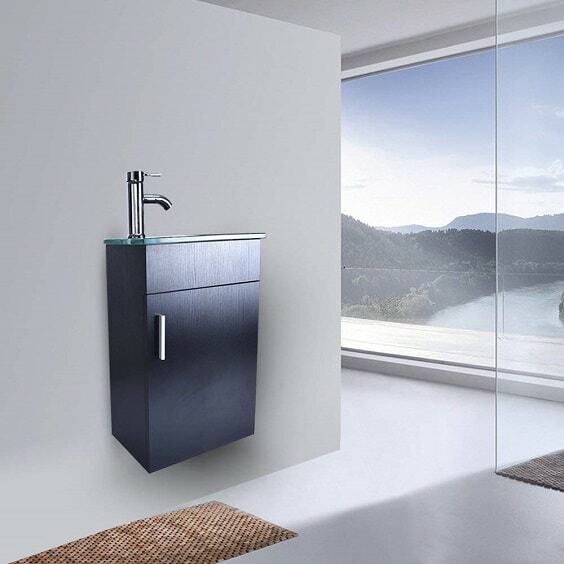 You can use them as the reference to find the best navy bathroom which really suits your needs and taste. 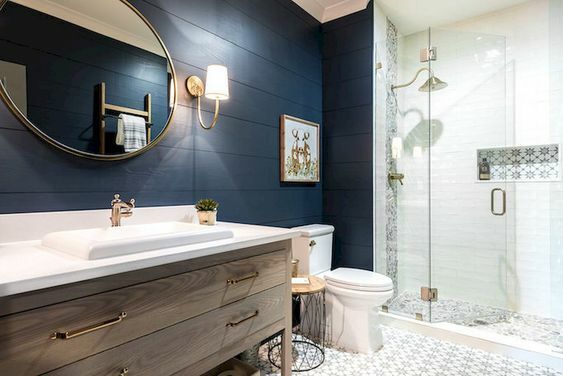 Choosing navy as one of the colors of your bathroom is definitely a good option to keep in mind. 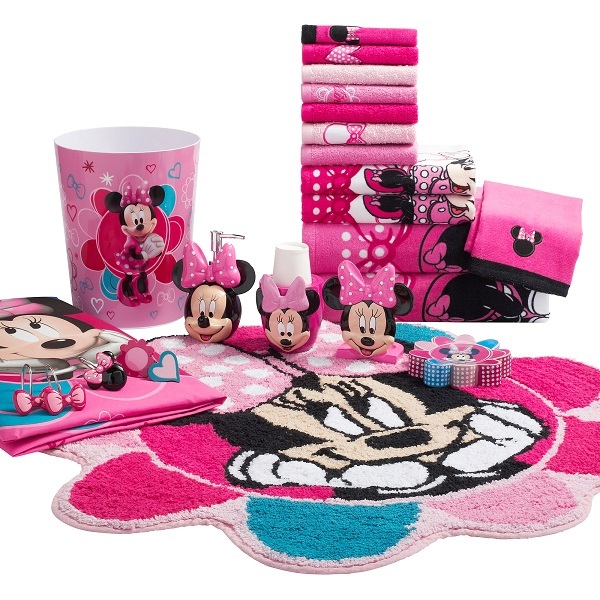 It will gorgeously make your bathroom look as stylish as possible. 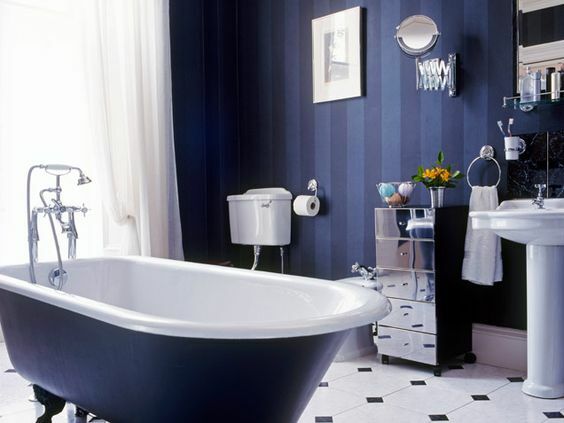 To ease you to create a navy bathroom, below we have some tips that you can consider. 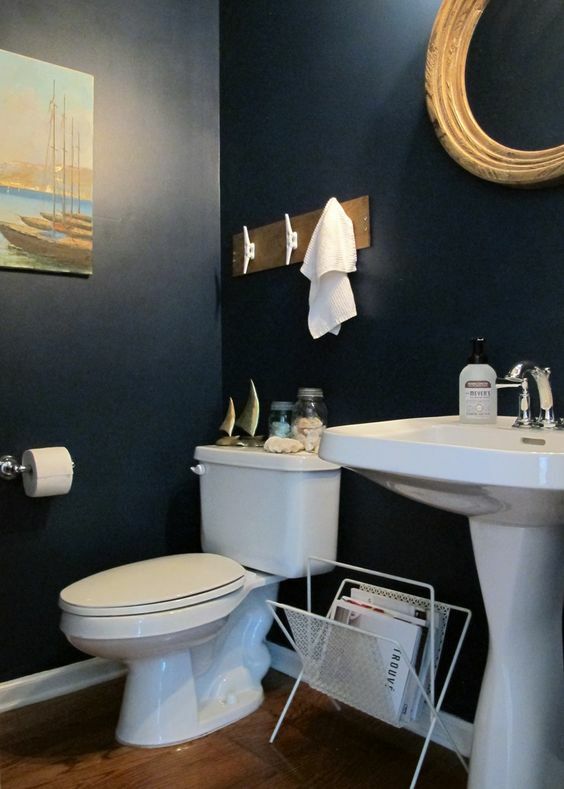 The easiest way to create a navy bathroom is definitely by painting the wall of the room with navy. You can choose whether to colorize all sides of the wall with the shade or just make it as an accent wall. Both of them are good options, but always use neutral shades like white or grey to balance the nuance. 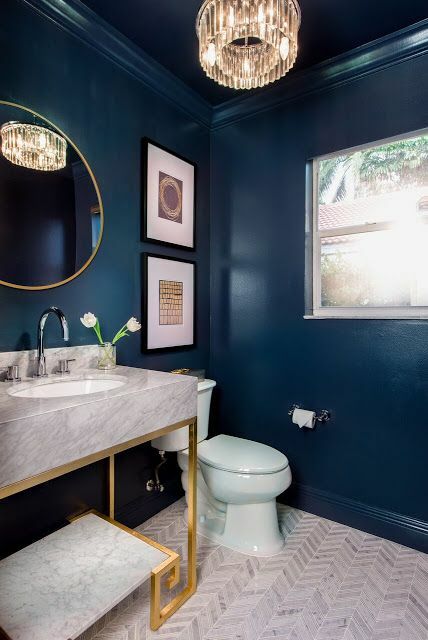 Instead of using navy as the background color of the room, you can just simply choose some focal points like a bathtub, vanity, or decor items in navy. This method works best of you have a bathroom with a neutral basic background color to let the color pops up attractively. 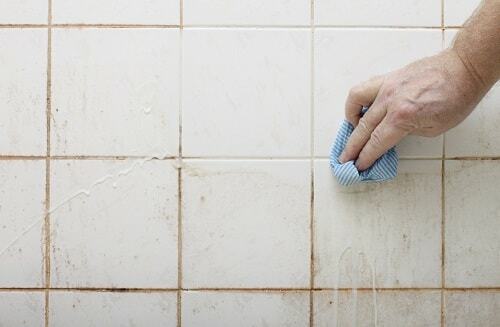 You can apply the shade to some accents of your bathroom like the shower room tile. Make sure that the navy looks outstanding by not adding too many additional colors.